Some days, you can store your meal-prepped lunch in a refrigerator. Some days, you have access to a microwave to heat up your meal to your heart’s content. But some days… you just don’t! I’ve been there. At my first job, fridge space was hard to come by, especially when the New Year’s resolutions to spend less money buying lunch rolled in every January. I’m secretly grateful that not always having fridge access space back then helped me find recipes that I felt confident eating at room temperature! Not to mention there’s nothing worse than being ravenous and having to wait in line for the work microwave that seems to break once a week. Not having access to a fridge or microwave at work doesn’t have to be what stops you from eating healthy, satisfying meals while working! Whether you’re on-the-go, between classes at school or just don’t have easy access to a fridge or microwave at work, here are 18 recipes that are perfect (and safe) to keep at room temperature or in a lunch box and are good to eat without reheating. Workweek Lunch offers dozens of no-reheat meal ideas that don’t have to be refrigerated in the WWL Meal Prep Program, but a few free recipes also fit the bill. Learn how to become a member and access all WWL recipes here. The go-to burrito bowl will never let you down, even at room temperature. You can keep extra toppings on the side, too, if you’re scared of them wilting on you. I can say from personal experience, this meal is so good no matter what temperature you eat it. Just out of the fridge? Delicious. At room temp? So satisfying. Warmed up? Like you’re in a restaurant. You can easily make it vegan by using tofu, tempeh or edamame. All you need is hot water! These are great for eating healthy on the road, between classes or at work as long as you have access to a kettle or source of hot water. Like all of my recipes, they’re insanely customizable and cheap to make. Trendy, yes, but for good reason! These grain bowls are not only filling, but they’re also great candidates for no-reheat/no-fridge lunches because they’re easily devoured at room temperature. The best part is, they’re super versatile — you can switch it up with whatever grain you have on hand or enjoy most. When I’m planning meals for a busy week, I know I’m in good shape if I have lentils and quinoa in my pantry. I love making this grain bowl if I know I’m going to be working remotely, but don’t want to spend $10+ on lunch just because I won’t have a fridge nearby. One of my favorite quinoa bowls not just because it takes 30 minutes to make, but because it ticks two of my favorite boxes: unexpected but delicious flavor profile, and ONE POT. It also keeps like a dream and somehow gets better as the week goes on. Sometimes I feel like couscous is the long-lost cousin of the grain bowl family, but I’m a huge fan. The spices on the chicken and the texture of couscous make this simple recipe a little unique, and not your average chicken and rice bowl! I like the idea of using Israeli couscous with this recipe. It’s hard not to love tabbouleh, and I love that with the help of quinoa, it can satisfy me as my entire meal. This recipe makes 6 servings, so it would be great to share with a partner or a roommate. This recipe features my favorite grain, farro. I love its chewy texture, and something about the roasted squash and farro combo just makes me feel cozy whether it’s chilled, warm, OR at room temperature! If you’ve never tried farro…I don’t have any clever to say, I just think you should try it! 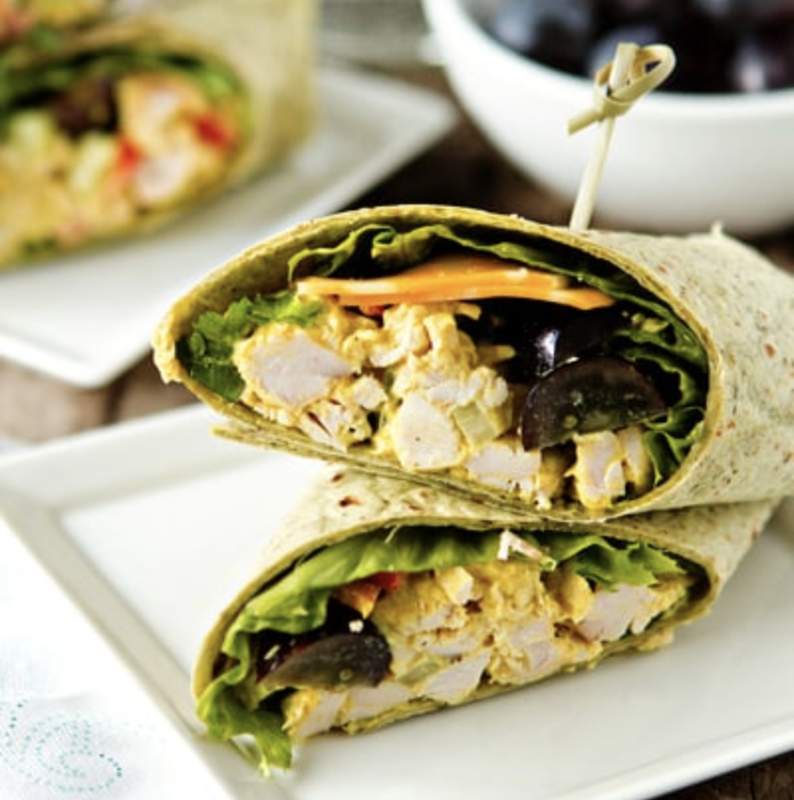 These sandwiches and wraps are self-contained powerhouses. Just assemble, pack, and enjoy when you’re ready, no need to heat up or keep cool. Pita pockets are hearty, durable, and portable, making them perfect for packing into your work bag or for a day on-the-go. Nearly anything you can put on a sandwich, you can put inside a pita pocket and it’ll be just as good. A perfect example is this upgraded PB&J, or whatever nut butter + fruit/jam combo works for you. Lately I’ve been packing almond butter and sliced plum with a little cinnamon sprinkled inside on Joseph’s pita bread [https://www.josephsbakery.com/shop/traditional-pita-bread/whole-wheat-pita-bread.html]. 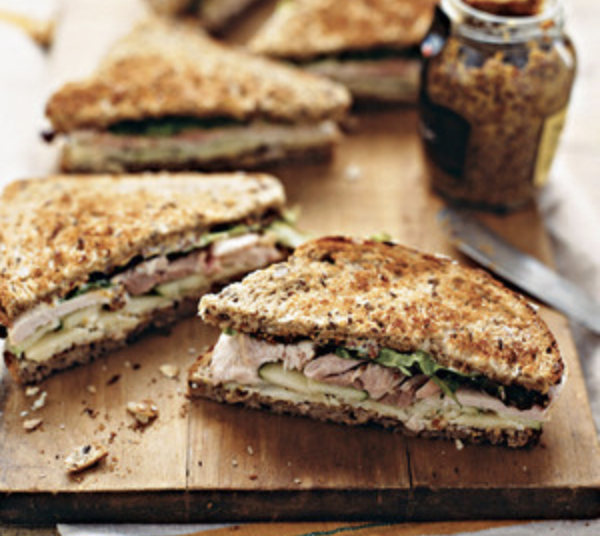 If you haven’t discovered the apple + cheddar + turkey combination, this sandwich is a great and easy start. Two pro-tips here: 1) to avoid soggy bread, toast it slightly before assembling the sandwich. 2) A little lemon juice prevents apple slices from browning…works like a charm! Mashed chickpea salad sandwiches are so easy and so customizable. You’ll love this on a sandwich, but it’d be delicious on a wrap or in a pita pocket too. The day I discovered curry chicken salad was a very happy day. Not a fan of mayo, like me? I sub plain greek yogurt with a little lemon juice. Put this inside a wrap, pita pocket, or on toasted bread and you’re in business. I was late to the buffalo-anything game, but buffalo tofu and tempeh is now something I crave at least once a month. Great on a sandwich or a wrap, or stuffed into a pita! They’re not just for summer barbecues. All the flavors in each of these salads will meld together, so by the time you sit down to eat lunch, it’ll taste even better than when you first prepped it! 5 ingredients + 15 minutes = 1 fresh salad. If you have a little extra time, I love roasting my own red peppers for recipes like this. Choose your favorite store-bought pesto, or if you own a food processor, you can try your hand at making pesto. Here’s an easy recipe that can be your go-to. So flavorful, and having this easy spicy peanut sauce in your arsenal will be a game-changer. Give me a Greek salad any day of the year and I’m happy. Just me? Add pasta into the mix and you give the Greek salad some staying power. The lemon juice is your secret weapon for keeping all the veggies in this salad extra fresh in your bag. Never thought to combine Mexican flavors with pasta? You really need to try this creamy, zesty salad with a kick. Maybe you’re on board with the no-reheat lunch lifestyle, but you still can’t wrap your around leaving your lunch unrefrigerated. Or maybe you prepped a delicious curry and want to enjoy the warm and fuzzy feeling it gave you the night before while you’re at work. I hear you! And the right lunchbox or lunchbox/ice pack combo can be your best friend for food storage. PackIt – Though they have many fun patterns and colors to choose from, these lunch bags aren’t just nice to look at. PackIt insulated lunch boxes come in a variety of sizes and shapes to suit your preferences, whether you’re looking for something smaller to fit in your backpack or a tote to throw over your shoulder. I bring my Pack-it to work every day! Even better, PackIt also sells a lunch bag and ice pack in one. Store the bag in your freezer overnight, and before you leave for work stick your meal prep containers inside. Then, keep it by your desk until you’re ready to dig in! Your lunch will stay chilled inside. MIER Adult Lunch Boxes – These bags are insulated, leakproof and spacious, MIER’s adult lunch boxes will keep your food cool (or warm!) for hours. Fit and Fresh Cool Coolers – Slim and easily packable, buy this set and use as many as you want to–or can fit in your lunch bag!–to keep your prep cold. Rubbermaid Sandwich Kit – This little BPA-free unit is a great option to not only keep your main meal cold, but also any snacks you’re taking for the day as well! HotLogic – If you’re someone who loves eating a hot lunch but you don’t have a microwave at your office, you should probably invest in this mini personal portable oven, which allows you to heat up food on the go and it’s totally safe. How cool is that! Do you have any go-to meals that you pack for lunch during the week that don’t need a microwave or a refrigerator? A favorite lunch bag that you would recommend to everyone you know? Share in the comments below! Thank you so much! We were constantly losing ideas to keep us satiated and happy! Get weekly meal prep tips from me!